What if the outside world changes quicker than the organization? Dutch society is changing very rapidly. Social organizations are facing the challenge of having to adapt continuously. But what is the direction of the change and how can you respond to an uncertain future? What is the impact of technology, an ageing population, people power and, for example, a lifestyle divide on Dutch society? What will be the long-term impact of citizens’ initiatives and care cooperatives? How will the sharing economy change the world of care and welfare? Is robotization a curse or a blessing for clients, or a threat to professionals? In a period of transition, many organizations that are active in the fields of welfare, care and the wider social domain have to turn their attention to both internal development and external changes. In order to be an organization that creates value today, but that is also future-proof. The construction of external scenarios is an important first step in developing a strategy for the future. In our view, the challenge for many professionals is to get a clear picture of the changing society. Because the rate of change on the outside determines the rate of change on the inside. Scenarios are not a goal in itself, but a tool to verify existing ideas and to improve the quality of strategic decisions. The construction of scenarios requires a considerable investment. Exploring trends and developments and determining their impact on the organization is a labour-intensive process. At BeBright, we’ve already done a lot of the work. It is possible to conduct a trend analysis and to get a grip on the main uncertainties in just two meetings with a compact core team. After all, we already know how the ageing population will affect the Netherlands in the coming years. BeBright has done a lot of research in recent years into the impact of technology on care and welfare. This is powered by an expert-based approach, making use of existing data as much as possible. 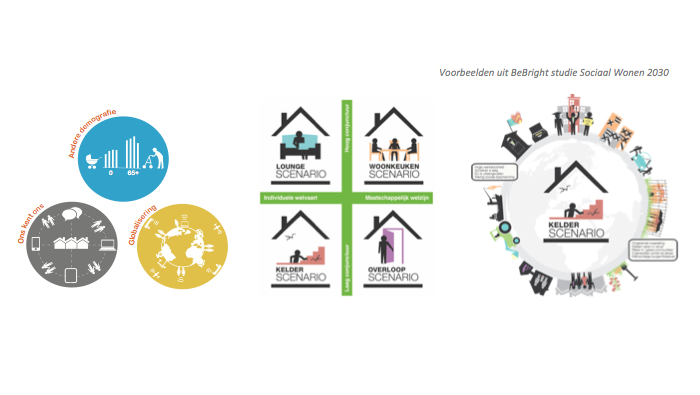 In 2015, the Association of Netherlands Municipalities (VNG) and the Dutch Ministry of the Interior and Kingdom Relations (BZK) collaborated with more than one hundred municipalities and social partners to construct scenarios for the social domain. BeBright supported this process. The scenarios paint a clear picture of the challenges in the next 5 to 10 years. At the heart of these are the changing attitude and relationship between citizens, businesses, organizations and municipalities. For example, we discovered that in one municipality the number of citizens who live independently but are in need of support will increase by one third over the next 10 years. During the scenario session, social services, mental healthcare (GGZ) institutions, neighbourhood police officers and housing associations agreed that this development is already noticeable. In the follow-up session, in which policy options were explored, the participants came up with a regional linking pin for vulnerable citizens. By sharing information with each other at an early stage, organizations and municipalities can join forces to provide tailor-made solutions to these vulnerable individuals and families. Looking at the numbers will reveal the scale and urgency of a problem. The shared interest brings organizations together to work jointly towards a solution. Scenarios for the future of our healthcare, the future of the housing market or, for example, the future of shopping form a basis for strategy. By imagining the future, strategic decisions of today can be verified. Thus we improve the quality and impact of these decisions. In the past five years we have helped several hospitals, mental healthcare (GGZ) institutions and nursing homes, residential homes and homecare (VVT) organizations take difficult strategic decisions. Examples are the disposal of real estate, bringing more focus in products and services, forming alliances, or the development of new care concepts. All of these are complex issues that we have been able to substantiate with a clear business case and view of the future. BeBright has gained extensive experience through conducting several scenario studies in retail, finance, insurance, healthcare, welfare, housing and education. These projects have resulted in several prominent publications and form the basis of many transformation programs. We have a trend database containing more than 40 extensively described trends and developments, readily available work methods, and a treasure trove of figures. This enables us to conduct a thorough and widely supported scenario exploration with you within a short time period. In 2016 we will once again share our knowledge with everyone who is interested. Because those who have a view of the future, can cease the opportunities it will bring!